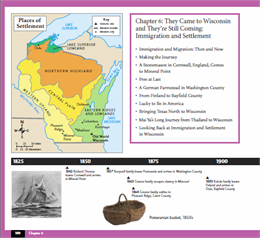 Here you'll find sample pages and the entire table of contents for the 1st and 2nd editions of "Wisconsin: Our State, Our Story," the definitive 4th-grade Wisconsin history textbook. Review these to see how the book addresses the fundamentals of Wisconsin history while promoting strong literacy skills. 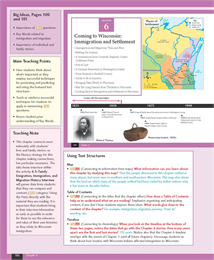 Download sample pages from the first or second editions of Chapter 6 of the Student Textbook, the Teacher's Edition, or the Student Activity Guide. 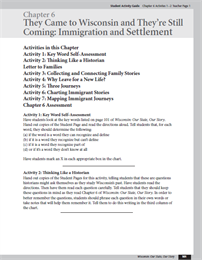 Chapter 6 discusses immigration and migration, both in the past and in the present. View sample pages from Chapter 6 of Student Textbook, "Wisconsin: Our State, Our Story." 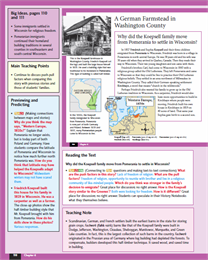 View sample pages from Chapter 6 of Teacher's Edition for "Wisconsin: Our State, Our Story"
How Do We Tell Our State's Story? What Does It Mean to Think Like a Historian? What Kinds of Evidence Do Historians Use? How Do Historians Use Evidence to Write History? What Happens at the Wisconsin Capitol? Get more information on obtaining a free preview copy of the textbook or how you can order classroom sets, the teacher's edition, the student activity guide, the Spanish edition and more.